Background: Biomedical knowledge graphs have become important tools to computationally analyse the comprehensive body of biomedical knowledge. They represent knowledge as subject-predicate-object triples, in which the predicate indicates the relationship between subject and object. A triple can also contain provenance information, which consists of references to the sources of the triple (e.g. scientific publications or database entries). 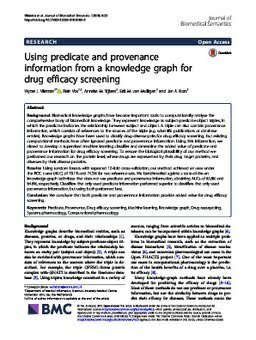 Knowledge graphs have been used to classify drug-disease pairs for drug efficacy screening, but existing computational methods have often ignored predicate and provenance information. Using this information, we aimed to develop a supervised machine learning classifier and determine the added value of predicate and provenance information for drug efficacy screening. To ensure the biological plausibility of our method we performed our research on the protein level, where drugs are represented by their drug target proteins, and diseases by their disease proteins. Results: Using random forests with repeated 10-fold cross-validation, our method achieved an area under theROC curve (AUC) of 78.1% and 74.3% for two reference sets. We benchmarked against a state-of-the-art knowledge-graph technique that does not use predicate and provenance information, obtaining AUCs of 65.6% and 64.6%, respectively. Classifiers that only used predicate information performed superior to classifiers that only used provenance information, but using both performed best. Conclusion: We conclude that both predicate and provenance information provide added value for drug efficacy screening.